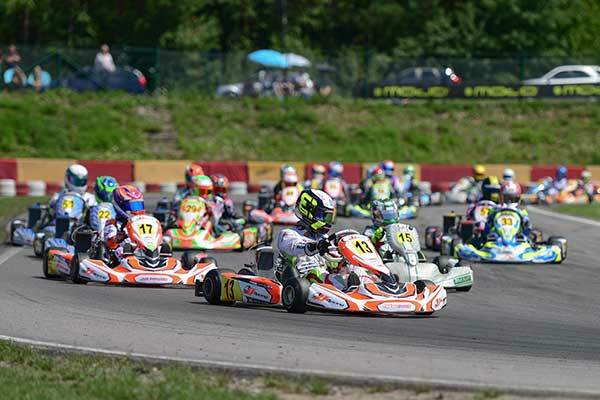 For the second half of the season, following the great races of Genk and Salbris, Rotax Max Euro Challenge’s third Kart Prix took place in Wackersdorf, in Bavaria, Germany on the weekend. Despite the weather forecasts and the initial low temperatures, the rain didn’t make its appearance and allowed for good racing throughout the weekend. 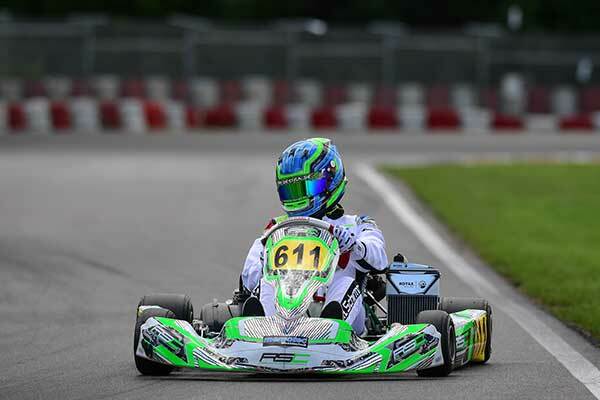 Winners Constantin Schoell and Robert de Haan in DD2 and mini respectively extended their lead in the championship, while Jordan Brown-Nutley’s win moved him back to the top in Rotax Seniors. 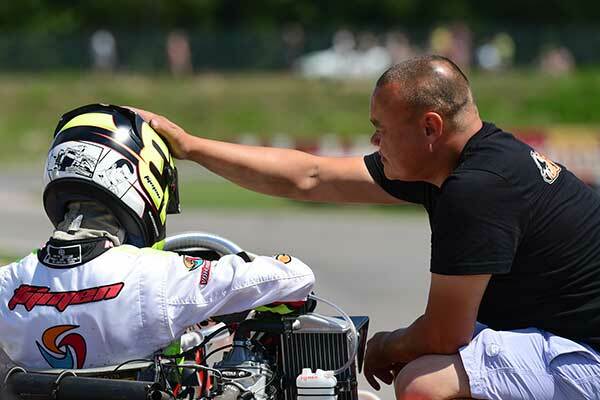 Mike Van Vugt winning the race moved closer to the top in Rotax Juniors but is still trailing Tijmen Van Der Helm by 2 points. Kris Haanen showed the best speed from Friday’s qualifying, and continued into Saturday’s heats with two wins and one second. 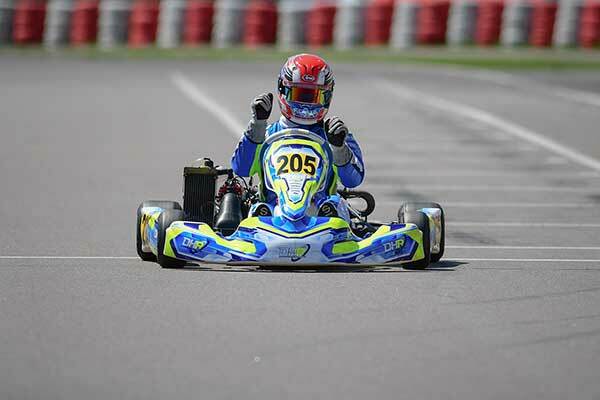 Robert De Haan behind him started Saturday with a win but could only manage two third position finishes in the remaining heats. Third after the qualifying heats was Balázs Válint, with a fourth, second and fifth places in the heats. Kris Haanen dominated the prefinal, however shortly after the session he was disqualified for a technical non-conformity. 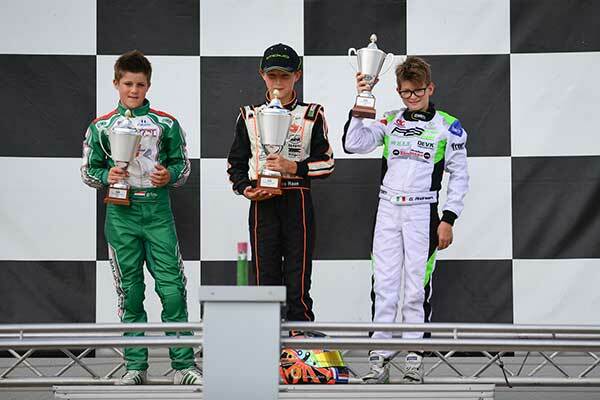 This gave the prefinal’s win to Válint and a big championship points advantage to De Haan who finished just behind. In the final, De Haan was challenged hard by second Válint but got the victory. Gianni Andrisani completed the podium in third place. Following the disqualification in the prefinal and the 7th place classification in the final, Haanen is at 213 points, 43 points behind De Haan at 256. He can still mathematically battle for the championship but will be difficult if De Haan’s good form continues next race. 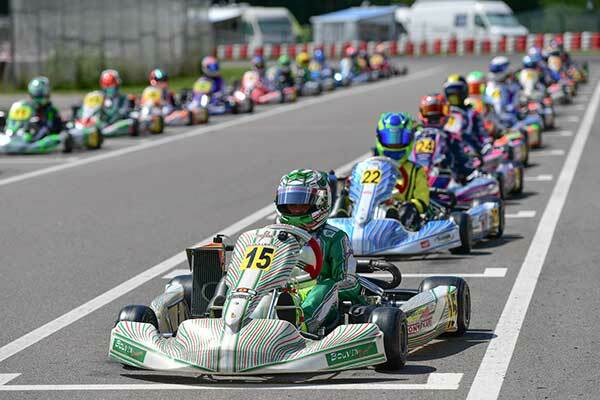 With 29 drivers present in germany, the category was on the up and many new drivers made their appearance. 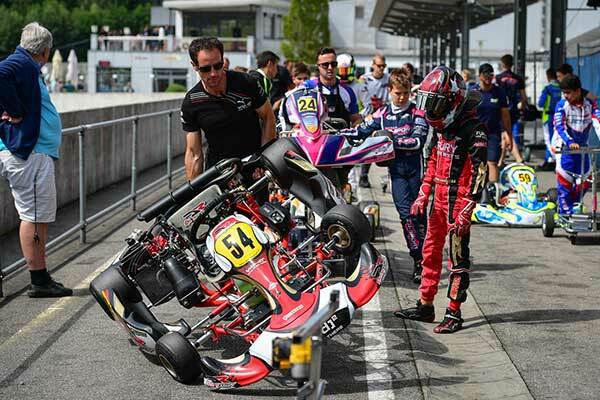 However once again the fight was between Tijmen van der Helm and Mike van Vugt, with the younger Luca Leistra challenging closely, this being the order already in Friday’s Qualifying Practice. Van der Helm classified first being tied on 5 points with Van Vugt after Saturday’s qualifying heats having scored one win, one second and one third each. Leistra with a win, a third and a fourth place classified 3rd behind them. 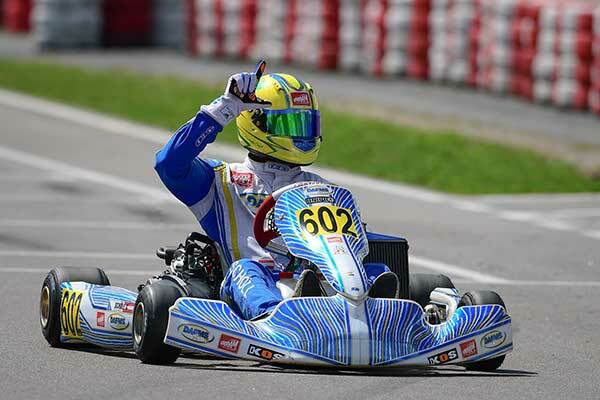 In the prefinal Leistra split the two Dutch drivers with Van der Helm winning once again and Van Vugt in third. Van der Helm got the better start in the final and lead the first half of the race, but Kobe Pauwels got in the mix, grabbing the lead for a lap. Soon after the battle came back to Van der Helm, and Van Vugt who overtook in the latter stages of the race for the win. Tijmen van der Helm is now leading the championship having won every single prefinal so far, but has only final race win compared to Mike Van Vugt’s two, including this race. Following strong earlier results, Brown-Nutley and Felix Warge would be expected to be the main contenders in this round. 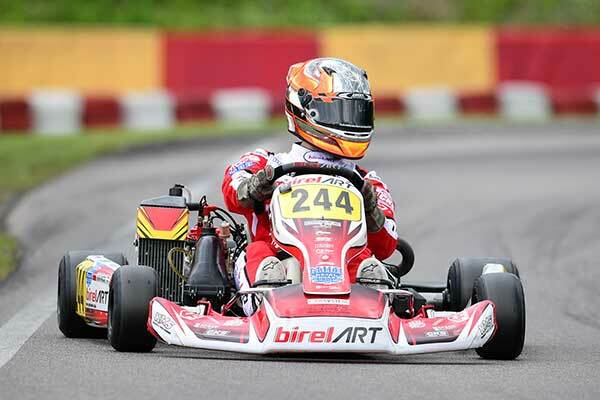 Starting Friday’s qualifying practice however, Brown-Nutley could only set the third fastest lap-time behind Zsombor Kovacs and Noah Roovers, while mid-season championship leader Warge was way down in 18th. Following Saturday’s qualifying heats, Tammy Bergmeier was the highest classified driver with two wins and a third. Brown-Nutley made up a spot to second with three second-place finishes. 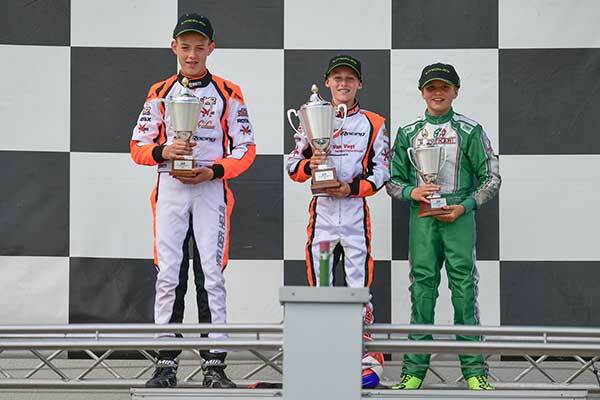 However, it was the third classified Harrison Thomas who made a very good showing despite his 9th place in the first heat, winning the second and finishing third in the third heat. Friday’s fastest Kovacs could only classify as good as 4th, while further back Warge made up places to 9th. Brown-Nutley quickly overtook Bergmeier for the lead in the prefinal, but the battle between the two of them continued for most of the race. Thomas got up to second place challenging for a while, but was missing some luck, as his engine seized on lap 10 out of 15. At this point Bergmeier had lost and extra place to Machacek. 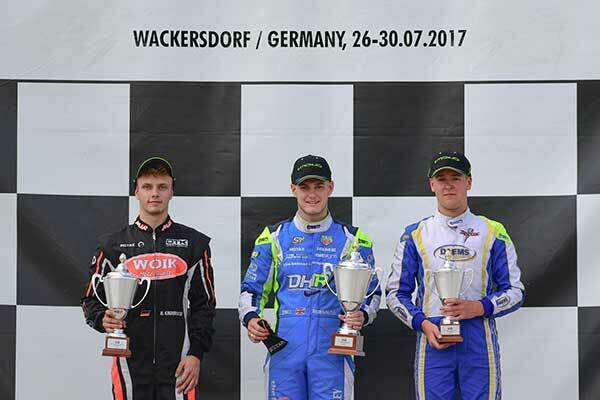 The finish of the prefinal found Brown-Nutley in first, Machacek in second and Bergmeier in third. In the final, Brown-Nutley took the start, and went on to lead every single lap of the race, winning it unchallenged. Right behind him, Bergmeier kept second place until lap 8 when eventually had to give in to Robert Kindervater and Noah Roovers for second and third. 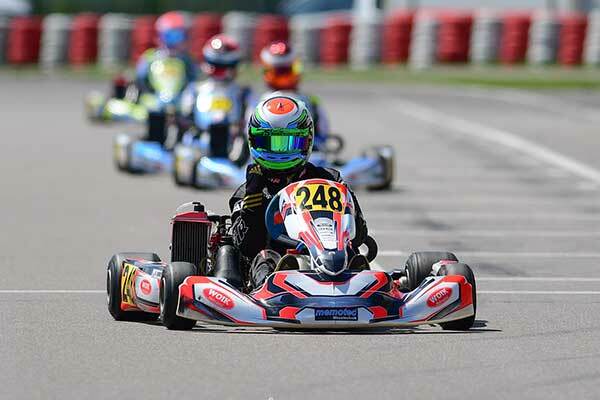 Following this race, Jordan Brown-Nutley regains the Rotax Senior Championship lead while Robert Kindervater moves also to second in points, capitalizing on Felix Warge’s 8th place finish who is now standing third. 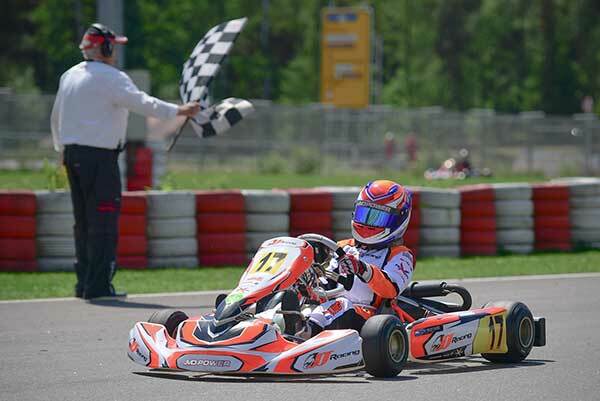 Marcel Schirmer was the fastest driver on Friday, qualifying ahead of Cosimo Francesco Durante and Kevin Ludi. Constantin Schoell and Max Fleischmann couldn’t repeat their great form from the last two races as they could only qualify 5th and 9th. Durante came first at the end of Saturday with a win and two seconds, Schirmer second with a win, a second and a fifth, and Schoell made a really good comeback with a third, a fourth and a win. 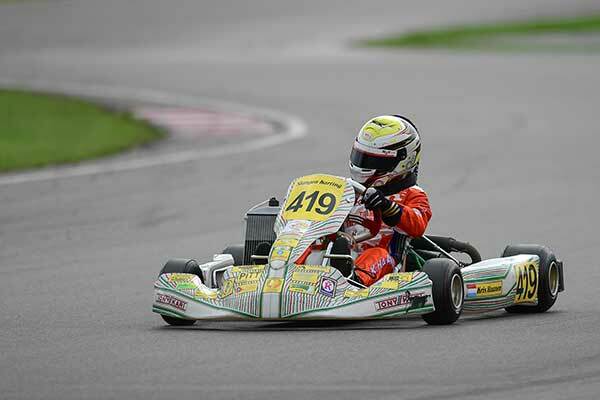 Ludi lost a place down to fourth and Fleischmann could only gain one place following the qualifying heats. 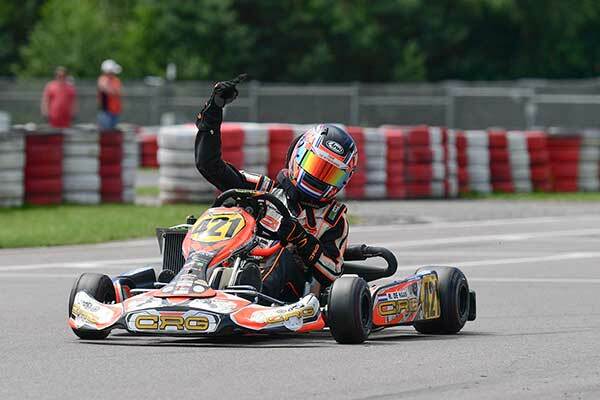 While the attention was Schirmer’s challenge to Durante for most of the race in the prefinal, Schoell made his attack in the closing laps to take the win. Durante maintained second, but Schirmer dropped down to 8th in the process. Barrie Pullinger didn’t hesitate to take the opportunity and finish third. In the final Schoell lead every single lap to take the win, but didn’t exactly go unchallenged, as he never got more than 1.5” gap to second, and only finished by 0.5” lead. Behind him initially was a battle between Durante and Pullinger, but around 4th lap a move from Ville Viiliäinen saw him grab second place and stay there until the end. Durante maintained his place and was the last to see the flag. First classified DD2 Master was Patrick Weinstock, with Manuel Scheibinger second and Fredrik Fransson third. Constantin Schoell has now extended his lead, with Max Fleischmann and Kevin Ludi close behind in points despite not making it to the podium. In DD2 masters Weinstock holds a clear lead being the only one to take points in last race, but Scheibinger and Fransson are tied on points right behind. 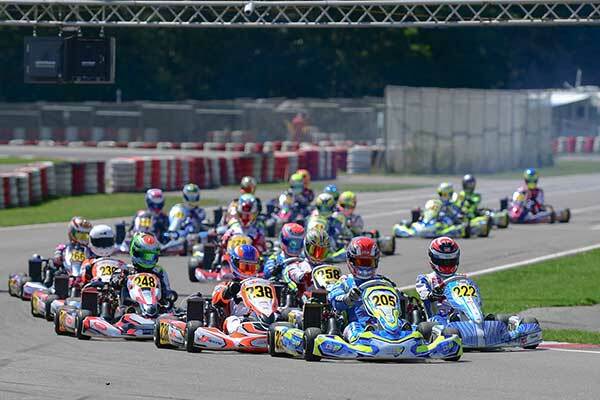 The last Kart Prix of the RGMMC Rotax Max Euro Challenge will take place in Castelletto 7 Laghi in the north of Italy on 20-24 September.